This is one of my favorite times of year to eat as there are so many healthy foods available bursting with flavor and nutrition. In this edition of the Dr. Joey newsletter, you will find information on how to make healthy harvest foods, some exciting new products that can help you lose weight around your abdominal region and... some fantastic anti-aging foods for your skin! If so, click here to view! Want to know if a vegan diet is healthy for you? Watch Dr. Joey on Entertainment Tonight to find out! FOODS, PRODUCTS, BOOKS & MORE! Cinnamon Apple Spice Tea by Celestial Seasoning – Have a craving for something sweet? Steep yourself a cup of this delicious herbal tea! 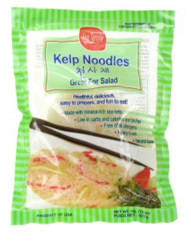 Kelp Noodles – At 6 (yes, six) calories per ½ cup and 1 gram of carbohydrate, it's hard to beat kelp noodles. Kelp is a super-healthy, gluten-free, fat-free sea vegetable that's exceptionally high in minerals such as iodine, calcium and iron. 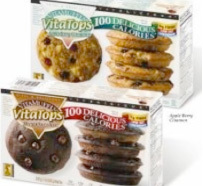 Vitalicious VitaTops muffin tops - With flavors such as triple chocolate chunk and deep chocolate – how can you go wrong? Yet, as rich as these baked goods sound, they're only 100 calories each and pack about 8 grams of fiber (thanks to whole wheat flour and inulin) and 5 grams of protein from egg white and skim milk powder! So next time you feel like indulging at the local coffee shop, pick up some of these muffin tops and snack smart. We like the Pumpkin Spice one to go along with our Pumpkin Latte (see recipe below). Available at Longo's, Bruno's Fine Foods, Costco, Loblaws, Metro and other fine grocery stores. Bamboo bottle - The Bamboo Bottle Company has created a stylish and more environmentally sound alternative to metal or plastic. Toppits Pop Herbs - Say good-bye to peeling and chopping smelly garlic and wasing herbs! Toppits flash frozen chopped cubes of garlic and herbs eliminates this work and waste. Simply pop out and mix into your dish. 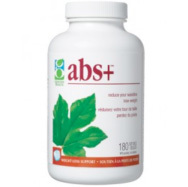 abs+ by Genuine Health - If you struggle with belly fat, this is one of my favorite weight loss supplements. An all-natural product, abs+ contains a blend of green tea extract (EGCG) and CLA (conjugated linoleic acid), two compounds proven in clinical trials to boost metabolism and produce results in as little as 90 days. Pumpkin Seeds - Also known as pepitas, pumpkin seeds are an excellent source of protein, iron, copper, magnesium, and zinc. Two tablespoons provides about 8 grams of protein, 5 milligrams of iron, and 2 milligrams of zinc, all very important nutrients for immune function and emotional balance. Pumpkin seeds have recently been found effective in the treatment of anxiety disorders because of their high levels of tryptophan, the amino acid precursor to serotonin. These little seeds also pack a lot of essential fatty acids, magnesium and chlorophyll which offer relaxing, balancing qualities. In the busy months ahead, give pumpkin seeds a try in your salads, hot cereal, homemade muffins or trail mix. Or, if insomnia plagues you, try grinding them in a powder with a coffee grinder, then blend with warm milk and honey as an excellent bedtime tonic. You only need a small handful to reap the benefits of this nutritional gem. Slow food is soul food. In a world that's dominated by fast food and McDonald's, the Slow Food Movement celebrates diverse flavors, authentic recipes, and traditional cultural rituals that heighten appreciation for the meal. 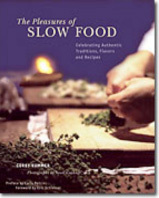 As Kummer demonstrated in the collection of simple recipes in The Pleasures of Slow Food, slow food is down to earth “peasant” food made the way grandma used to make it. In preserving the time-honored methods of baking bread, braising meat and dressing homegrown salad greens, slow food supporters diminish the ill effects of industrialized food production and, all the while sharing laughs, wine and delicious flavors with their loved ones. This book definitely offers recipes that are get the mark of two thumbs up! Mix milk and pumpkin in a small pot on the stove, add pumpkin pie spice and protein, and heat until steaming, stirring occasionally. Pour into coffee mug and stir in espresso. Top with some pumpkin pie spice, nutmeg or cinnamon and enjoy! In a small pot, bring milk and water to a boil over medium heat. Add oats and spices. Reduce heat to medium-low and simmer until liquid is absorbed, about 5 to 10 minutes, stirring occasionally. Once absorbed, stir in pumpkin and sweetener (if using) and sprinkle with almonds; set aside. Combine water / milk and protein powder in a separate bowl and mix until protein is dissolved (mix in a blender / Magic Bullet for a smoother consistency). Pour protein mixture over oatmeal and enjoy! Heat oil in a non-stick skillet over medium heat. Add sweet potato, saute for 3 minutes. Add broccoli, cauliflower, onion, garlic, and curry powder. Cook for another minute, stirring. Add broth, pepper, chickpeas and tomatoes. Bring to a boil, then cover and let cook for 10 minutes, reducing heat to a simmer. Stir occasionally.To serve, sprinkle with chopped fresh cilantro and a side of yogurt to balance out the heat. At Shulman Weight Loss Clinic, we are so proud of each and every pound lost by our clients. This month, we want to congratulate Darlene for losing 67 pounds! In addition to putting an end to her diabetes and balancing her blood sugars, Darlene has lost so much weight – she even went down a shoe size! Congrats Darlene – we are thrilled for you. Want to learn more about the Shulman Weight Loss team of nutritionists? Click here!